Asian Parasols and Sun Umbrellas from Thaialnd. 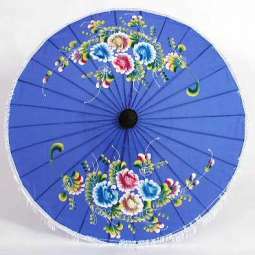 We have these great Japanese Parasols, as well as cloth and paper parasols from Thailand. Chiang Mai is known for the beautiful arts and crafts, and these Asian parasols are just one example of the craftsmanship there. Each cloth parasol has about a half an inch of fringe on the edges which hangs down and adds to the attractiveness. These wonderful parasols (or sun umbrellas) are extremely popular at our store, and people love how they offer shade from the hot summer sun. But many people use them for decorating their homes, office and apartments. We have two at our place that we use as screens for some very bright lights. Did you see us in Star Magazine? Well we are glad you made it to our site. Click the photos below to see our parasols or to order one. We think you are going to love these sun umbrellas, because they are not only practical - helping to provide shade during this hot summer - but they look great! Please also note that while people love them for the shade they provide, these parasols have not been rated for UV protection! If you are UV sensitive and are looking for UV protection, you should consult with your physician regarding the use of these parasols first.